SAN DIEGO, Calif. — Jan. 29, 2019 — HoverCam, a leader in innovative, interactive, and engaging education solutions, will demonstrate how it puts the most important elements used in today’s digital classrooms right at teachers’ fingertips to create a learning experience that’s simple, mobile, and collaborative. In booth 1673 at TCEA 2019 the company will showcase its Pilot Series of digital teaching stations; wireless Ultra 10 document camera; and ClassFusion, a classroom presentation and learning management system for today’s digital classrooms. At its booth, HoverCam will showcase the Pilot X, the next addition to the award-winning Pilot family. The Pilot X is a tablet-based, battery-operated wireless digital teaching station that’s designed for ultramobility. With the new podium, teachers are unchained from stationary desks or lecterns and are free to move about the classroom. The Pilot’s wireless transceiver instantly beams the podium’s screen and touch annotations to any interactive flat panel, projector, or TV in HD resolutions up to 4K, eliminating the hazard of dangling cords and cables. The tablet can be charged while docked in the station or be removed to grant teachers more flexibility around the classroom. At the end of day, users simply remove the tablet and store it in the base for security. Also at the show will be the Pilot 3, the world’s first fully integrated wireless digital podium teaching station. 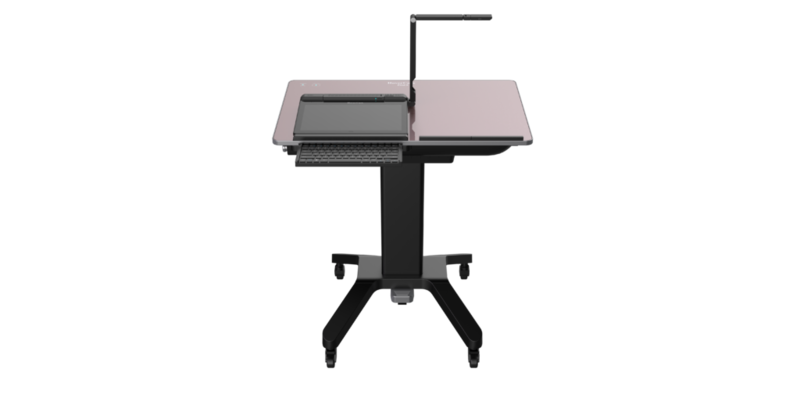 Featuring a Windows PC, 13-megapixel document camera, and 21-inch touchscreen with wireless HD mirroring functionality in a mobile podium, it eliminates the outdated AV cart and combines the most important elements used in today’s digital classrooms. Heralding the next generation of document cameras for the classroom, HoverCam’s Ultra 10 is a powerhouse loaded with options to fit every teacher’s need. Featuring a 7.1-inch capacitive touchscreen, true 4K HDMI output, 16-megapixel sensor, and driven by a powerful Android computer, the Ultra 10 is the ultimate document camera and is ideal for remote learning. The built-in, multitouch viewing monitor allows educators to see exactly what their students see without having to turn their backs. Users can connect a display, IFP, or projector — via wired HDMI or an optional wireless 4K transmitter without a PC — to easily record lessons, capture vibrant images, and show live video in 4K clarity. Attendees will also have the opportunity to see a demonstration of ClassFusion, HoverCam’s comprehensive software for a fully digital classroom. It’s one of the first software solutions that integrates a classroom presentation system with a learning management system designed for wireless and interactive collaboration in a multidevice ecosystem classroom. It features dynamic lesson and notes capture, a lesson plan builder with access to a database of over 4 million resources matched to curriculum; teachers’ calendars; space-saving; vector-based lesson recording to the cloud; enhanced whiteboarding with smart tools including handwriting and object recognition; online homework submission and student messaging; Hopscotch multisplit, and more.